Stonehenge is a massive stone monument located on a chalky plain north of the city of Salisbury, England. Research shows that the site has continuously evolved over a period of about 10,000 years. The structure that we call ‘Stonehenge’ was built approx. 4,000 and 5,000 years ago and that forms just one part of a larger and highly complex, sacred landscape. The biggest of Stonehenge’s stones, known as sarsens, are up to 30” tall and weigh 25 tons on average. It is widely believed that they were brought from Marlborough Downs, a distance of 20 miles to the north. Smaller stones, referred to as ‘bluestones’ weigh up to 4 tons and come from several different sites in western Wales, having been transported as far as 140 miles. It’s unknown how people in antiquity moved them that far. Scientists have raised the possibility that during the last ice age glaciers carried these bluestones closer to the Stonehenge area and the monument’s makers didn’t have to move them all the way from Wales. Water transport thought raft is another idea that has been proposed but researchers now question whether this method was viable. The dramatic, contrasty B&W is perfect for this, Ann. Absolutely fabulous shot, Annie Girl! The dramatic clouds just add to the B&W texture of the stones. I am still your #1 fan!! The best photo of Stonehenge I have seen. Excellent image of this impressive monument. A REMARKABLE image, Ann. Ansel Adams would be proud !! 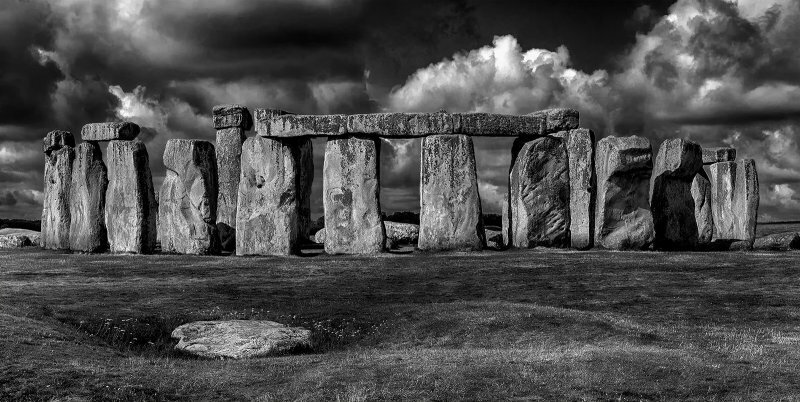 A super study of Stonehenge, great lighting. Ann, I'm in with Ruth and Ken! I've never been to England but have read about Stonehenge, pondering how the heck people did it! I've come to the conclusion it MUST have been Aliens, LOL! Seriously, this is a superb B&W rendition of an incredible monument. Superb is everyway; lighting, composure, composition, just one question? Where are the tourist? I always imagine this to be surrounded by people ; >). Super dramatic shot Ann, well done, perfect processing for this subject. Ann, This is one of the finest pictures of Stonehenge that I have seen. It shows the enormity of the stones.The ever changing cloud formations and Hallowed atmosphere that surrounds this site. Spectacular image Ann, wonderfully composed and processed.